I must confess that the boat project has been taking precedence over sewing lately, but a glitch with a piece of machinery has caused my progress to come to a grinding halt. Just for the heck of it, here's where I left off. I'm not even going to try to explain what's going on here. It was nice to finally start the velvet jacket. I haven't sewn for a long time. Was it in May?? I've had the pieces cut out for awhile, and now that I have the coordinating fabric there really isn't an excuse not to jump in. 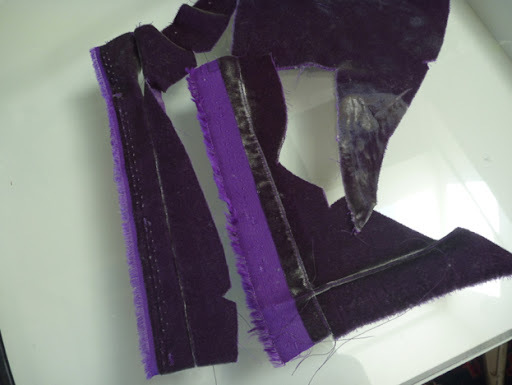 I've had so many suggestions and tips from my readers regarding working with velvet. It's been a huge help and I'm so greatful. The consensus has been that I cut with the nap down. I stood in front of a mirror flipping my fabric back and forth trying to determine the difference. It's a subtle one that's for sure. In the end I decided to take your advice and cut with the nap down. The effect was somehow just a bit softer visually. At times there's almost a silvery sheen which I find very attractive. Plus, as some of you mentioned, it just feels divine. What's this mess? I experimented with a few seams and pressing before lauching into the real deal. I just didn't know what to expect. So here's what this velvet virgin has learned so far. 1. I had no difficulty sewing a seam that had been basted. Any of you that have followed my sewing adventures know that I'm a baste-a-holic anyway. I haven't had to adjust my methods much. I usually use a white cotton basting thread, but because of the delicate nature of my fabric I'm using silk thread for the first time. They say it doesn't leave any marks, which is completely true. What they don't tell you is that it's a dream to work with. You can toss the beeswax. I haven't had a tangle yet! 2. I'm able to "press" the seams by just hovering my steam iron over them. I started on the silk setting but have been able to dial it back to synthetic on medium steam. I'm working from the back and not applying any pressure at all. The iron never touches the fabric. 4. You don't have to run out and invest in a velvet pin board. I took the advice of one of my readers and covered my pressing surface with a scrap of velvet. So far it's working just fine. So this my set up. Just a scrap draped over my tailor's ham. Then steam from the backside. The back of this jacket has princess seams. Are they prince seams on a man's jacket? I can't say that I'm a huge fan, and I find them challenging to do well. 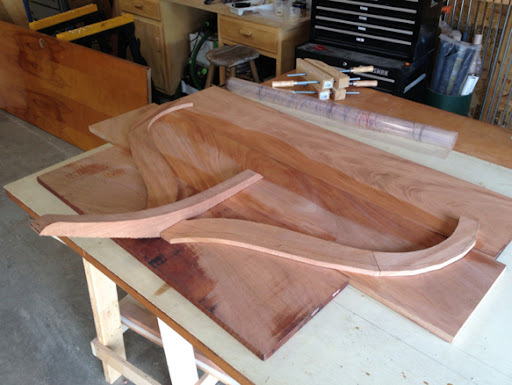 Normally I would ease the curve of the side piece with machine basting, but I'm sure that would spell disaster with velvet. 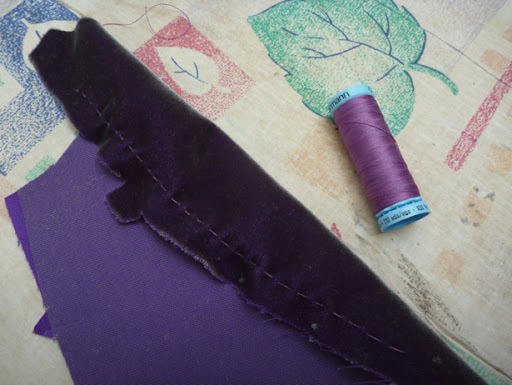 Using my silk thread I eased the back with a line of small basting stitches just inside the seam line. After taking up the thread just a touch, I had no difficulty basting the side to the middle back and sewing it on the machine. BTW I'm taking a reader's suggestion and sewing all my seams in the direction of the nap, top down. 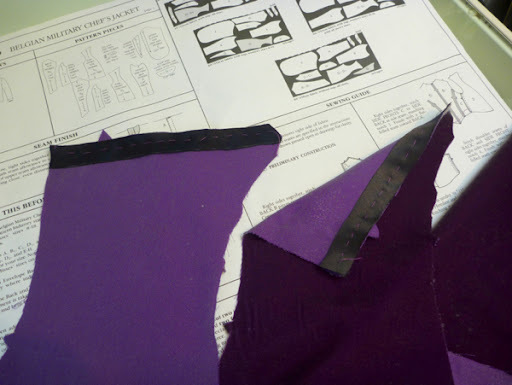 To prevent stretching of the shoulder seams, I use a technique from Roberto Cabrera's tailoring book. 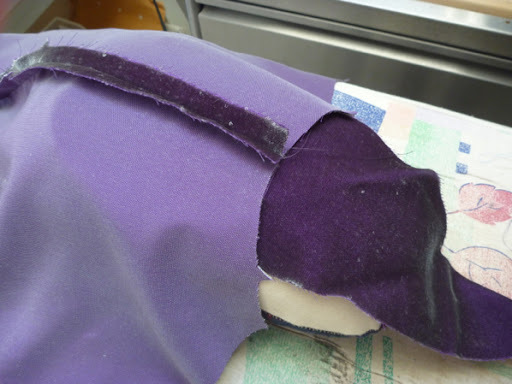 A semi-bias strip of lining material is basted to the forward shoulder seam so that it will be caught in the seam when it's sewn on the machine. Easy and effective. I will be tackling the sleeves next, and I expect them to be a challenge. Can't wait to see the jacket, and I hope you keep us updated on the boat! Do you own a walking or even-feed foot? The thickness of 2 layers of velvet can make things slip even with great basting. It might be worth a try on some scraps. So excited for you! I want to leap into the screen and stroke it! Velvet can do that to an otherwise sane person! I just found your blog from Seamstress Erin. I was blown away by your style and skill. I'm eagerly awaiting your velvet jacket reveal!